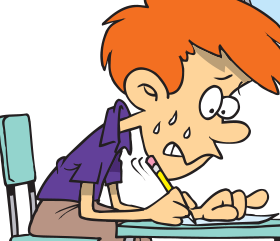 Are you stressing out about your driver's license test? Afraid you're not going to pass? Don't be! At DMV Test Cheat Sheets, we've got the driver's license test questions - and answers - that you're looking for. Go into your test with the info you need to pass on your first time! Getting your driver's license is a big deal - it gives you freedom and bragging rights amongst your friends. Don't be the last person in your group to get licensed! Using our Test Cheat Sheets, you can take your driver's license exam with confidence, knowing that you'll pass. Our Cheat Sheets - Available for Cars, Motorcycles, and Even Trucks! Did you know that you can get a commercial license at age 18 as long as you work within your home state? How about that you can get a motorcycle license at age 16? If you're 15 or 16 years old and think that you can only get a license to drive a car, you should know that you have all sorts of options! And for this reason, we offer Cheat Sheets for all types of licenses. If you want to have a career as a truck driver - say, driving tractor-trailers or tow trucks or even garbage trucks - there's no better time to prepare than now. Go into your test fully prepared, with one of our handy Cheat Sheets at your fingertips! Do You Have a Smartphone? Then You Have Cheat Sheets! So how do our Cheat Sheets actually work? Well, it's actually quite simple. With a one-time, super low payment of just $9.95, you can get access to our Cheat Sheets via our website, which you can access with your smartphone. All you have to do is login with the access information that we provide you. Once you're logged in, you'll find driver's license test questions and answers that you can reference when taking your exam. Going for a Class M license instead of a Class C license? Live in Florida instead of, say, California? No problem! 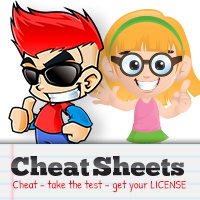 We have Cheat Sheets for every state and every license type, so you're sure to get the one that you need! Just select your license type, select your state, and start cheating!